Happy Thanksgiving, guys! In observance of Thanksgiving, Cobb County graciously gave me my offspring for an entire week. What is this about? I'm pretty sure when I was growing up, we had like two days off. MAX. But not here in the land of wonky school schedules. It's me and them for an uncountable number of days straight. Coinciding with their week off, the weather quickly turned from a typical Maine summer day into a Siberian Christmas. I took this opportunity to order my first North Face coat. I had tried it on back in August when Mr. Yoy and I had visited Boston. Although I'm all about an impulse purchase, I decided to hold out until it was legitimately cold. My coat arrived yesterday. I ripped open the package and immediately modeled it for my kids. They were less than impressed. It was basically like wearing a blanket, which was my goal, but it made me look like a giant box with twigs coming out the bottom. Spongebob. Spongebob wearing a gray coat. Regrettably, I decided today was the day I'd run by The North Face store in Buckhead to try on a size smaller to see which fit better. And the Yoys were coming, too. They immediately protested. They refused to get dressed, but I wasn't scared. Sure, wear your pajamas around town. Look like a hot mess. I'm forty now and too old to care. Little E went jacket-less to really hammer home his look. I knew my time at The North Face would be very limited. I wanted to stay and wrap myself in all of their glorious jackets, vests, and hats. But the Yoys made sure everyone knew they were there. They harassed mannequins, slammed themselves into walls, and ran laps. WHAT PART OF STAND RIGHT BY MOMMY IMPLIED YOU WERE TO ACT LIKE YOU WERE IN A UFC DEATH MATCH? The sales woman was beyond gracious and immediately engaged the boys, which helped tremendously. I apologized profusely, leaned over, and whispered bone-chilling threats into my beloveds' little cold ears. In the end, I exchanged my coat for a different style. The small was about seven slices of Publix birthday cake too tight, which was a bummer. 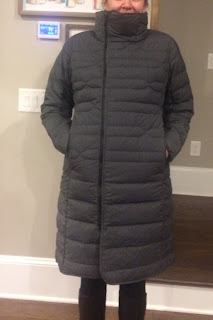 The new coat was 30% off, which was not. Stay warm and Happy Thanksgiving from the Yoys! Your phone rings. You fish it out of the bottom of your purse. ELEMENTARY SCHOOL shows up on the caller ID. 1) MY KID IS SICK/INJURED. I have received this call a few times. The last time, Little E fainted at school due to a combination of a cold and medicine that I had given him. I also have an adverse reaction to cold meds, and I didn't even think that my children could have it, too. That was one was on me and was scary as hell. The nurse had to call an ambulance. 2) MY KID IS IN SUPER BIG TIME TROUBLE. I have also received this call. A few times from Little E's pre-school (I know, I know, he's perfect. How could this happen?) And one time regarding Big E and a private parts contest in the cafeteria during lunch. But for the most part, my kids are well behaved at school and save their satanic tendencies for when they come home. It's impossible to be well behaved ALL DAY. Because we all know this never happens! Today, I was picking up some last minute items for Little E's science fair project. A mother walked by me on her cell phone. SO THEY WERE DOING MATH ON THE COMPUTER AND HIS GROUP HAD DONE AN INTERNET SEARCH FOR GIRLS IN BIKINIS? I looked over at her. She began to blush. I get it. I've been there. YES, I UNDERSTAND. WELL THANKS FOR CALLING ME TO LET ME KNOW OF THE SITUATION. I'LL TALK TO HIM WHEN HE GETS HOME TODAY. I'M A GOOD PERSON AND I DON'T APPROVE OF THIS BEHAVIOR! I'M TRYING MY HARDEST TO RAISE A GOOD PERSON AND IT IS SO CHALLENGING! I smiled at her as I walked by. I should have given her a Mrs. Yoy blog card with the website. Because, I know her pain. Big time. Little E: What the F? The annual Toys R Us toy catalog arrived in the mail today. This is a monumental day for the Yoys. It is the day that they go page by page, circling toys that they want me to buy them for Chanukah, that I'll probably never ever buy them for Chanukah. But it takes up a good hour of their time, so I'm all for it. Even if it means crushing their consumer dreams. He was reading aloud all of the details of this S'more Maker. All I could hear was "THIS THING WILL MAKE THE BIGGEST MARSHMALLOW MESS EVER AND DO NOT ALLOW IT INTO YOUR HOME." Little E was struggling with one of the words. MOM, WHAT DOES THIS SPELL: F-U-C-K-E-R-S. I shot up from my chair and walked over to him and this pornographic catalog. FLICKERS. AAAAAAHHHHHHHH, it spells flickers. As in a flame. I stifled a laugh and handed it back over to Little E.
No chance in hell, my friend. It's family picture eve. This is a pretty big holiday around here. Brainstorming sessions, wardrobe, etc. We take our yearly holiday card very seriously and the family picture is crucial. I've worked hard this week to hold my crazy in check. I didn't cut or file their fingernails, although I knew I ran the risk of Little E slashing up his face. I let them wrestle out back with their friends. I sent them to school not rolled up in bubble wrap. Previous family pictures include Mr. Yoy and a peeling forehead. He didn't think he needed to apply sunscreen during a mid-day out door sporting event. In those pictures, he's wearing a baseball hat. Another year, Little E had such bad baby acne I debated using concealer on his chubby, little face. In recent years, we've really pulled it together. I got cocky. I thought I had tomorrow's shoot in the bag. Until Big E broke out in hives after dinner last night. They covered his face, arms, and torso. Note, this is Big E, not Little E, the king of hives. Little E pops a chest full of hives just by looking at a fragrant dryer sheet. That kid has the most sensitive skin. Big E has beautiful, olive-toned skin (Thanks, Grandma V!) He never has a blemish. Nothing. My how the tables have turned. By morning, the hives had mostly subsided with the exception of his face. Of course. After school they were still there, so I gave him a dose of zyrtec and willed them to fade into obscurity. 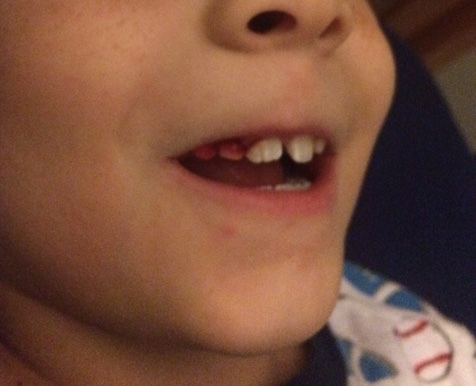 Not to be outdone by his skin, Big E's teeth decided to make themselves known. I've previously documented Big E's upper teeth issues. The orthodontist and I have been waiting for this one particular tooth to come out. And I guess that process started tonight. It won't fall out. It just bleeds and bleeds and Big E won't let me touch it. He said it doesn't hurt, which is great. But in the meantime, it looks like he ate someone for dinner. I asked him to wiggle it with his tongue in the hopes it came out before bedtime. He fell asleep instead. I'm hoping in the morning that he hasn't eaten that tooth and the blood bath has subsided. If not, we are going to need some serious photoshopping magic. Or fake teeth and some foundation. I don't know about your house, but we are in serious Halloween countdown mode. Eleven days until my kids can don their chosen costumes and gorge on candy and wine. Oh, wait. That last part is all me. I'd tucked the Party City bag full of their costumes and props away, so nothing was destroyed and/or lost during the ramp up to Halloween. Until last night, when the Yoys went digging in the hall closet. Big E immediately opened his packet of violations. I think this is why he chose to be a SWAT Officer. Just so he could issue tickets and be all-around bossy. What is this you are wondering? Well, it's a $200 violation (which I maintain is pretty pricey for my first offense) for purchasing Little E a Hufflepuff robe for Halloween. You see, in my constant state of rushing around like a mad woman trying to check all the items off of my neverending to-do list, I purchased Little E the Harry Potter robe from the wrong house. He wanted to be Harry Potter, himself, who wears a Griffindor robe. If you've never read Harry Potter, I'm sure you are thinking...NO BIG DEAL. But we are the Yoysers. 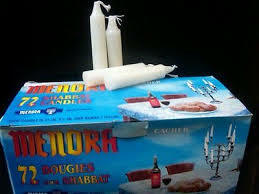 Big deals around here include who washes their hands first before dinner and who gets to pick out the Shabbat candles on Friday night. From a box full of the same exact damn candles. IT'S A BOX FULL OF 72 WHITE CANDLES. JUST GRAB TWO FOR THE LOVE OF EVERYTHING HOLY! I guess I should thank Big E for noticing my error. I probably wouldn't have ever seen it. But look, there it was. Little child models mockingly wearing their Hufflepuff robes. Damn you, Hufflepuff and your gold scarves. In my mind, I had already formulated a game plan. Being a parent is like living in crisis mode, I'm always waiting for the next catastrophe to be thrown my way. I would get up in the morning, run to Party City and pray to the Halloween gods that they still had a size small Griffindor robe available. I knew that my chances were slim, but I sustained myself on Coke Zero and hope. That's all I got. And if they didn't have a robe, I'd just stick with Hufflepuff. Little E probably wouldn't notice, anyway. Half the time, he's completely unaware of where he is. It's kind of an awesome way to roll through life. But just as I was having this thought and giving Big E the death stare so that he wouldn't say anything, Little E grabbed his robe and pointed at the word Hufflepuff. MOM, THIS IS THE WRONG ROBE! YOU BOUGHT HUFFLEPUFF! Damn, damn, double damn. Why did he have to learn to read?! Before he could get hysterical, I told him I'd go first thing in the morning, to exchange it. And that I did. The Harry Potter section of Party City was very sad and barren. I cursed myself internally for a minute, took a deep breath, and whipped out my iPhone. Please, please, please. Amazon, if you can hear my prayers, please have a size S Griffindor robe. So if you saw me fist pumping in Party City this morning. Sorry, I'm not sorry. I'm a mom. And I'm killing it. Another week, another bullsh*t school scheduling move by Cobb County. This week we have early dismissal every day so that the parent/teacher conferences can happen in the afternoon. Your kid is intelligent, but lazy as hell and has a bad habit of (picking nose/sucking thumb). You can circle the bad habit depending on if this is Big or Little E. It's like choose your own bad ending. So now I've got seven long a** hours from when they energetically bounce off the bus and when I attempt to put them to bed. Almost every night at dinner, I give Big E a half of a melatonin to get him to fall asleep. No melatonin means an 11PM bedtime, which makes for very painful 6AM mornings. Last night, as I prepared dinner, I was chatting on the phone with Mr. Yoy, who has been in California since Friday, but it feels like he's been away since 1998. Big E eats off a blue plate and Little E eats off a red plate. It's super Type-A, but it keeps them from fighting over mind numbing subjects like how many string beans are on the plate. They both get vitamins, which I doled out properly. One for me as well, because I'm jonseing so badly for candy that even a vitamin in the shape of a gummy bear gets me pumped up.. I cut the melatonin up and put it on Big E's plate. At least I thought I did. Right in the middle of reading Harry Potter, I looked down on the floor and saw Little E down for the count. And he was out. Snores and all. I had to dead lift him off the ground, with my bad back and it was like lifting a wet noodle. Big E, on the other hand, folded laundry, built legos, did learning books, and watched some HGTV with me. At around 10PM it dawned on me. DID YOU TAKE A MELATONIN AT DINNER? At first he said yes, but then he admitted that he hadn't. SH*T! I DRUGGED THE WRONG YOYSER! Around 11PM, Big E finally dozed off next to me. Tonight, I will pay better attention. We are finishing up our fifth week of school. We are mostly in the groove. Mornings are always sketchy as hell because, while I am a morning person (rainbows, singing, smiling), my kids are not. Especially, Little E who I have to wake up every single morning. Left alone, he would sleep until eight, just like Mr. Yoy. If I could get them to bed at seven, mornings would be better, but no matter how hard I try, the 7PM bedtime is merely a myth here at the Yoys. Like seeing Mr. Yoy during daylight hours or good East Cobb Sushi. 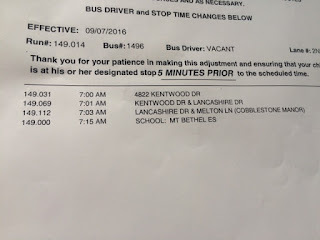 The bus comes around 7:30AM. I try to have the boys out of the house by 7:20. A 7:30 pickup might not sound so bad to some of the other local moms, but the kids are late to school every day. This means Little E doesn't have time to do his morning work, which means additional work is sent home at night. It isn't ideal. 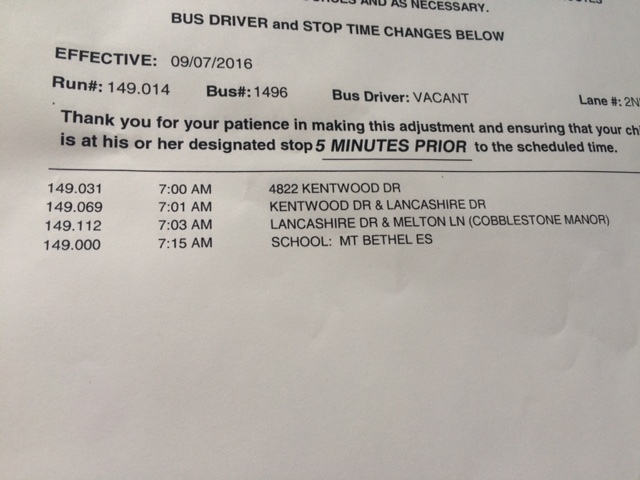 But I'm not upset enough to complain, as our bus pick up time at the beginning of last year was 6:56. Yes, that time starts with the number six. And even Little Miss Morning Sunshine can't drag her a** out of bed before 6:30. This morning we received the frantic BUS!!! text from one of my neighbors as I pleaded with Little E to put down his unfinished breakfast and head out the door. For the record, he refused and turtle walked to the bus stop while eating a bowl of soggy cheerios, milk dribbling down his chin onto his shirt the entire way. We just lost thirty AM minutes. This is the equivalent to several hours in afternoon time. It immediately put me in a bad mood and I called Mr. Yoy to vent. And he laughed like a woman in the throws of hysteria. (Sympathy may not be his strong suit.) 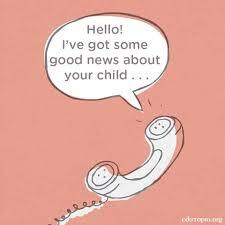 I sent murderous vibes through the telephone and noted that while he remained snug in bed EVERY MORNING while I feverishly got these kids ready for school, we would make sure to be extra loud going forward.